Join us for free making and performance activities this half-term, inspired by the exhibition Frida Kahlo: Making Her Self Up. Learn about the story of Frida Kahlo and explore your own identity through making and portraiture. 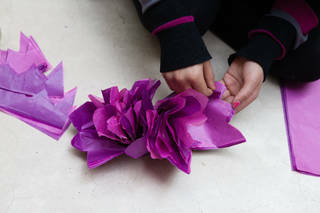 Create symbolic and colourful flowers and add them to the Mexican garden setting in the gallery. Draw your own portrait or on your body lying down and display your work inside our own blue house. This activity was designed in collaboration with costume and set designer Ryan Dawson Laight. Please note that this event is inspired by the exhibition Frida Kahlo: Making Her Self Up. If you would like to attend the exhibition, tickets can be purchased separately here.